QUESTION: WHAT CAN I DO WHEN I DO NOT HAVE A LANDLORD/TENANT RELATIONSHIP WITH AN OCCUPANT WHO IS A TRESPASSER LIVING IN MY RENTAL UNIT WITHOUT MY PERMISSION? California Law has numerous helpful tools that assist the landlord/owner of a rental unit for evicting an unwanted occupant. However, it must be remembered that the owner/lessor of the rental unit must use one of the tools provided under California Law and not engage in self-help measures to oust an unwanted occupant on their own. One such tool is called a Forcible Detainer Action which can be found in the Code of Civil Procedure Section 1160. To qualify for a Forcible Detainer action, the owner/lessor of the rental property must have not have given the occupant permission to live in the rental property. In other words, there is no landlord/tenant relationship so the occupant is a trespasser (neither a tenant nor tenant’s assignee or sublessee). The landlord may regain possession through a Forcible Entry or Forcible Detainer proceeding. Who, in the night-time, or during the absence of the occupant of the rental property, unlawfully enters upon real property, and who, after demand made for the surrender thereof, for the period of five days, refuses to surrender the same to such former occupant. Under this statute, the occupant is defined as a person who is, within five days preceding such unlawful entry, was in the peaceable and undisturbed possession of the property. Just as with all Unlawful Detainer actions, forcible entry and detainer are also summary proceedings that involve the limited question of possession and damages that have resulted from the unlawful possession. The landlord may seek restoration of possession of the property through a forcible entry or forcible detainer action. 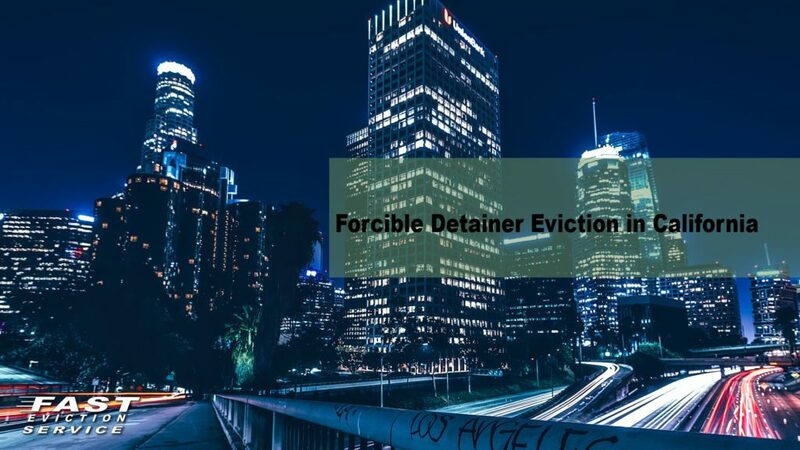 The first step in evicting an unwanted occupant who has ousted the owner/lessor/ or original tenant by means of physical or verbal force is to serve a five day notice to vacate. Once the Notice has expired the Summons, Complaint and Prejudgment Claim of Right to Possession is filed. The defendant must ordinarily answer the complaint within five days (including Saturdays and Sundays but excluding all other judicial holidays; CCP §§ 1167, 1167.3); no cross-complaints are allowed (Schubert v. Lowe (1924) 193 C 291, 294, 223 P 550, 552); and trial must ordinarily be held within 20 days after request for trial setting (CCP § 1170.5)..
At trial Plaintiff must prove The evidence at trial will show that (1) Plaintiff is the owner/lessor/original tenant of the rental property (2) Plaintiff was in peaceful possession of the rental property before she was ousted out of possession by the conduct of Defendants; (3) Plaintiff caused a 5 Day Notice to Quit-Forcible Detainer to be lawfully served on the Defendant; (4) Defendant(s) failed to vacate prior to the expiration of the Notice; (5) Plaintiff has incurred monetary damages at the fair market daily rate of the rental property; and (6) Plaintiff is entitled to statutory damages at $600.00. In this manner, the Plaintiff will prove a prima facie case for Unlawful Detainer.